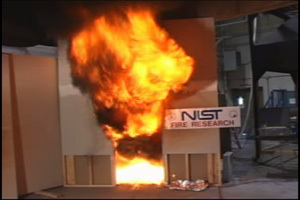 Fire Dynamics is the study of how chemistry, fire science, material science and the mechanical engineering disciplines of fluid mechanics and heat transfer interact to influence fire behavior. In other words, Fire Dynamics is the study of how fires start, spread and develop. But what exactly is a fire? NFPA 921: "A rapid oxidation process, which is a chemical reaction resulting in the evolution of light and heat in varying intensities." Webster's Dictionary: "A fire is an exothermic chemical reaction that emits heat and light"
Fire can also be explained in terms of the Fire Tetrahedron - a geometric representation of what is required for fire to exist, namely, fuel, an oxidizing agent, heat, and an uninhibited chemical reaction. Heat Energy is a form of energy characterized by vibration of molecules and capable of initiating and supporting chemical changes and changes of state (NFPA 921). In other words, it is the energy needed to change the temperature of an object - add heat, temperature increases; remove heat, temperature decreases. Heat energy is measured in units of Joules (J), however it can also be measured in Calories (1 Calorie = 4.184 J) and BTU's (1 BTU = 1055 J). Temperature is a measure of the degree of molecular activity of a material compared to a reference point. Temperature is measured in degrees Farenheit (melting point of ice = 32 º F, boiling point of water = 212 º F) or degrees Celsius (melting point of ice = 0 º C, boiling point of water = 100 º C). 1 Klinghoffer, Max, M.D., “Triage Emergency Care Handbook,” Technomic Publishing Company, Inc., Lancaster, PA, 1985. 2 Veghte, James H., Ph.D., “Physiologic Response of Fire Fighters Wearing Structural and Hazmat Protective Clothing,” Second Annual Conference on Protective Clothing, Clemson University, May 1988. 3 Huck, Janice, “Evaluation of Heat Stress Imposed by Protective Clothing,” First Annual Conference on Protective Clothing, Clemson University, May 1987. 4 American Society for Testing and Materials, ASTM C1055, Standard Guide for Heated Systems Surface Conditions That Produce Contact Burn Injuries, 4:6, ASTM West Conshohocken, PA, 1997. 5 Bynum Jr., D. Dr., Petri, V. J., et. Al. ; Domestic Hot water Scald Burn Lawsuits – The Who, What, When, Why, Where How; Annual ASPE Meeting; Indianapolis, Indiana, October 25-28, 1998. 6 Shugar, G.J., Shugar, R.A., Lawrence, B., “Chemical Technicians’ Ready Reference Handbook,” McGraw-Hill Book Company, New York, 1973. 7 Krasny, John F., Sello, Stephen B., “Fibers and Textiles, Fire Protection Handbook,” 16th Edition, 1986. NFPA, pp.5-27. 8 Fang, J.B., and Breese, J.N., “Fire Development in Residential Basement Rooms,” National Bureau of Standards (currently NIST), NBSIR 80-2120, Gaithersburg, MD, 1980. Heat Release Rate (HRR) is the rate at which fire releases energy - this is also known as power. HRR is measured in units of Watts (W), which is an International System unit equal to one Joule per second. Depending on the size of the fire, HRR is also measured in Kilowatts (equal to 1,000 Watts) or Megawatts (equal 1,000,000 Watts). Heat Flux is the rate of heat energy transferred per surface unit area - kW/m2. 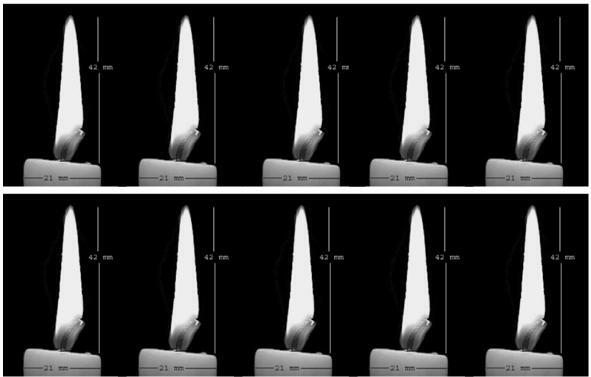 One candle vs. ten candles - same flame temperature but 10 times the heat release rate! 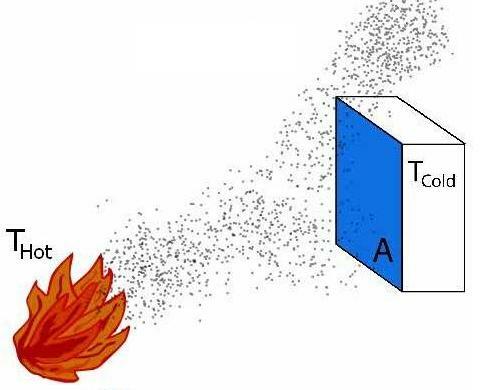 Heat transfer is a major factor in the ignition, growth, spread, decay and extinction of a fire. 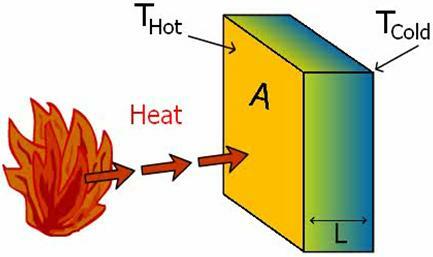 It is important to note that heat is always transferred from the hotter object to the cooler object - heat energy transferred to and object increases the object's temperature, and heat energy transferred from and object decreases the object's temperature. 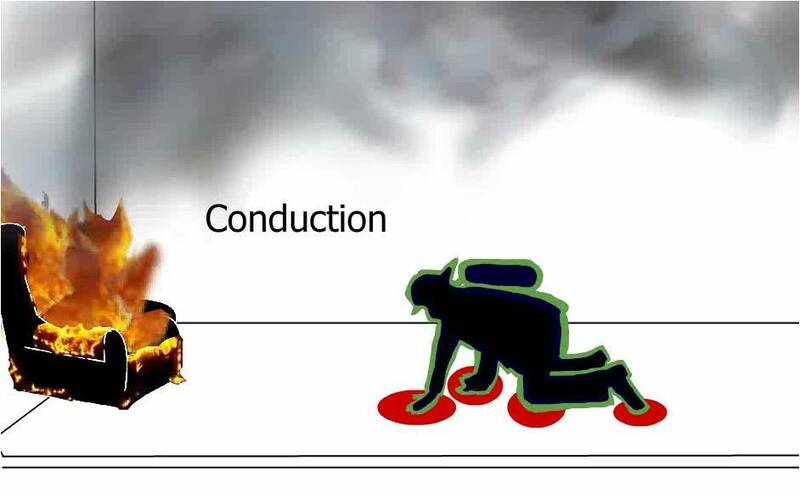 Conduction is heat transfer within solids or between contacting solids. Where T is temperature (in Kelvin), A is the exposure area (meters squared), L is the depth of the solid (meters), and k is a constant that unique for different materials know as the thermal conductivity and has units of (Watts/meters*Kelvin). Convection is heat transfer by the movement of liquids or gasses. Where T is temperature (in Kelvin), A is the area of exposure (in meters squared), and h is a constant that is unique for different materials known as the convective heat transfer coefficient, with units of W/m2*K. These values are found empirically, or, by experiment. For free convection, values usually range between 5 and 25. But for forced convection, values can range anywhere from 10 to 500. 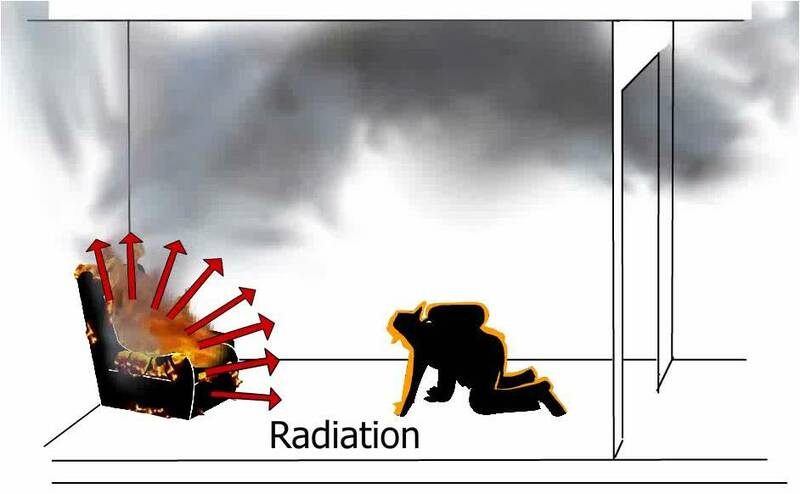 Radiation is heat transfer by electromagnetic waves. 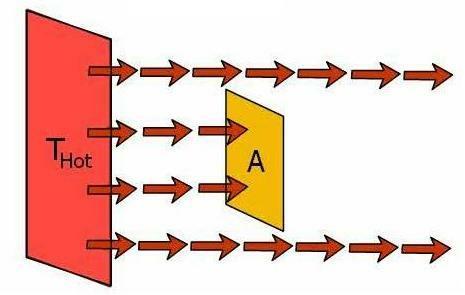 Where T is temperature (in Kelvin), A is the area of exposure (in meters squared), α is the thermal diffusivity (a measure of how quickly a material will adjust it's temperature to the surroundings, in meters squared per second) and ε is the emissivity (a measure of the ability of a materials surface to emit energy by radiation). Fire Development is a function of many factors including: fuel properties, fuel quantity, ventilation (natural or mechanical), compartment geometry (volume and ceiling height), location of fire, and ambient conditions (temperature, wind, etc). 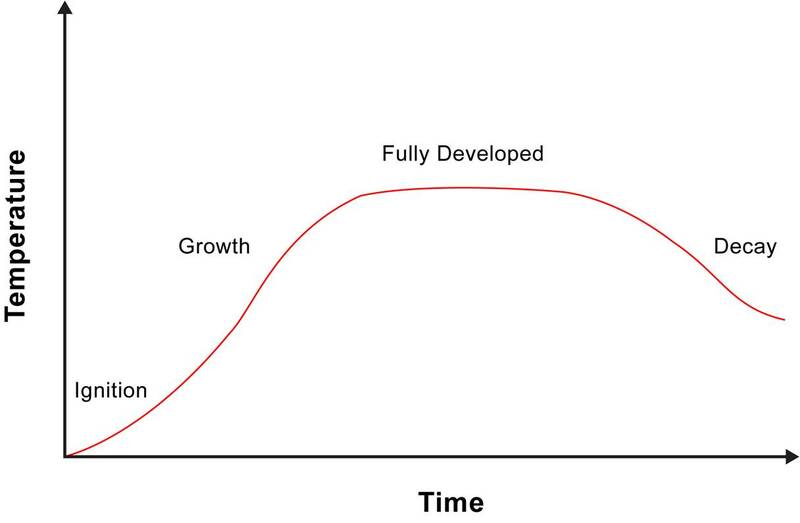 The Traditional Fire Development curve shows the time history of a fuel limited fire. In other words, the fire growth is not limited by a lack of oxygen. As more fuel becomes involved in the fire, the energy level continues to increase until all of the fuel available is burning (fully developed). Then as the fuel is burned away, the energy level begins to decay. The key is that oxygen is available to mix with the heated gases (fuel) to enable the completion of the fire triangle and the generation of energy. 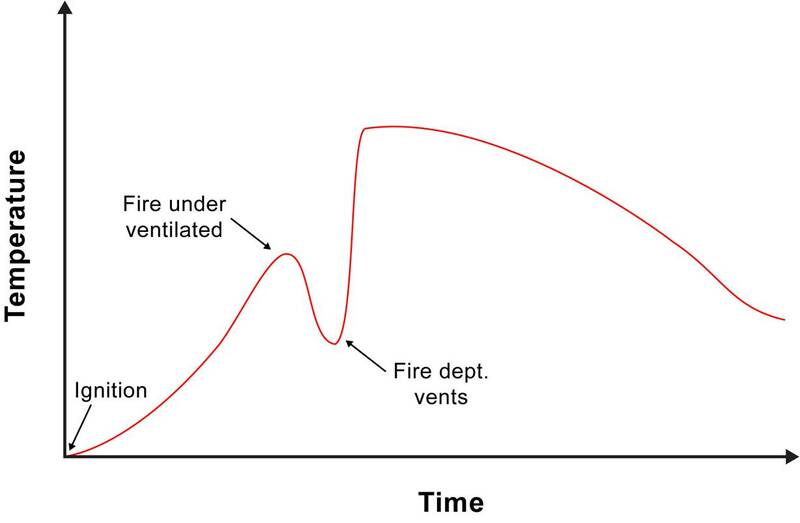 The Fire Behavior in a Structure curve demonstrates the time history of a ventilation limited fire. 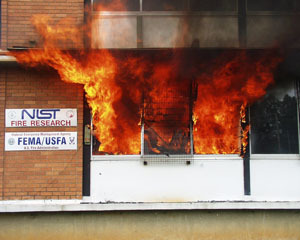 In this case the fire starts in a structure which has the doors and windows closed. Early in the fire growth stage there is adequate oxygen to mix with the heated gases, which results in flaming combustion. 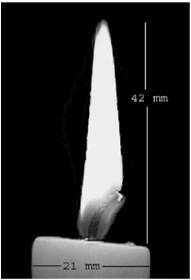 As the oxygen level within the structure is depleted, the fire decays, the heat release from the fire decreases and as a result the temperature decreases. When a vent is opened, such as when the fire department enters a door, oxygen is introduced. The oxygen mixes with the heated gases in the structure and the energy level begins to increase. This change in ventilation can result in a rapid increase in fire growth potentially leading to a flashover (fully developed compartment fire) condition. 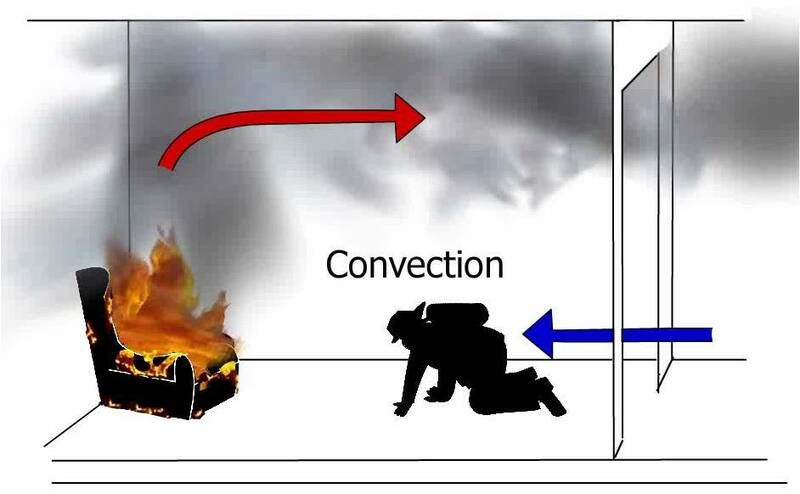 Flashover is the transition phase in the development of a contained fire in which surfaces exposed to the thermal radiation, from fire gases in excess of 600° C, reach ignition temperature more or less simultaneously and fire spreads rapidly through the space. This is the most dangerous stage of fire development.